The Outdoor Scene in Goatstown, on the south side of Dublin, is the No.1 outlet in Ireland for Weber Barbecues. Weber BBQ Grills are renowned for their top quality build, innovative designs, expansive barbecue range, and of course great flavour results. <h4>Get to Know the Weber Gas Barbecue Range</h4>Outdoor.ie offers a comprehensive online catalogue of the most popular Weber Barbecue products, as well as their extensive range of barbecue accessories, and protective covers. 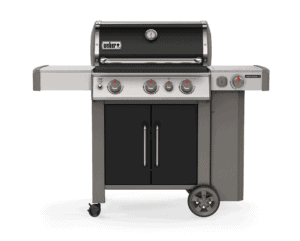 Browse the Weber Gas Barbecue selection, and buy online. Assembly options for local Dublin customers.It the Outdoor Scene's mission to help grow the Weber brand in Ireland by offering the best deals on all Weber gas barbecue gas grills.The Outdoor Scene's service and advice on gas barbecue products will not be bettered. Outdoor.ie's staff are fully trained in the Weber Barbecue school and can give you the best advice on the right Weber gas barbeque for your needs.Prices on Weber gas barbecues are the most competitive online and, the Outdoor Scene offer <strong>e</strong>. The Outdoor Scene also delivers to the UK and Europe with competitive delivery charges.Over the years, the Outdoor Scene has carried a wide range of barbecue brands, and the range continues to include the best available brands. Because of our tried and test expertise, the Outdoor Scene is considered Ireland's best gas barbecue retail and online shop.</p>The Outdoor Scene has been selling Weber barbecues for more than 15 years, and Weber is still considered are the best value gas barbeque brand on the market. Browse our extensive line of Weber Gas Barbecues today.</p><h4>Nationwide Delivery on all Weber Gas Barbecues to the Republic of Ireland</h4>Your barbeque will arrive boxed. If you are located in Dublin or local surrounding areas, the Outdoor Scene can assemble your barbecue for you, for a small additional charge.Many of our happy customers often ask if the Outdoor Scene staff can assemble their Weber barbeque for them, and the answer is almost always yes! If you are considering a Weber gas barbecue, and live locally to Dublin, we highly recommend taking advantage of this assembly offer.This assembly option includes connecting up your gas so your Weber barbeque will be ready fire up as soon as the barbecue assembly is complete. 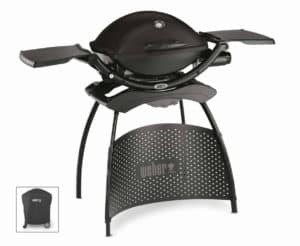 <h5>The Weber Q Series Portable Compact Barbecue Range</h5>Weber Gas barbeques, sometimes referred to as 'gas grills', includes the Weber Q Series with the Weber Q1000 a popular portable barbeque. The weber Q1000 portable gas barbecue uses disposable gas canisters, but can also be adapted to use the bigger bottle. 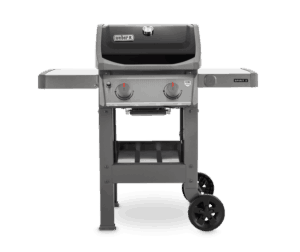 The Q series also includes the the Weber Q1200, Weber Q2200 and the Weber Q3200 barbecues. 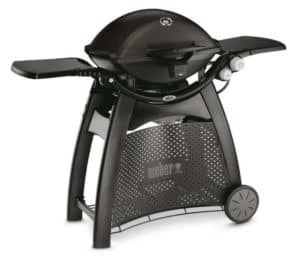 A popular favourite, and top recommendation is the <a href="https://www.outdoor.ie/product/weber-midi-q2200-with-permanent-cart-54010074p/">Weber Q2200 Barbecue</a> as it is small enough for easy storage and folds away nicely while also being big enough to cook for 6 to eight people.<h5>The Weber Spirit Series BBQ Grills</h5>The Weber Spirit gas barbecues are a modern addition to the Weber gas barbecue range, and the Spirit Classic is the entry level model. 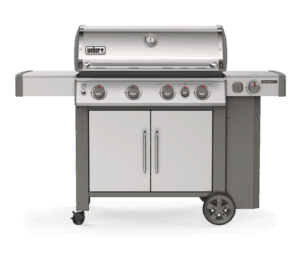 The Weber Spirit Classic gas barbecues consist of the classic 2-burner BBQ design as well as the Weber Spirit Classic 3-burner barbeque grill design. The Weber Spirit Original series offers cast iron grills plates, a stylish opening door and full cabinet surround as standard. 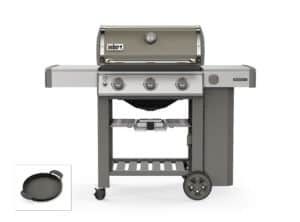 The top of the range Weber spirit is the <a href="https://www.outdoor.ie/product/weber-spirit-premium-s-310-46500574/">Weber Spirit Premium S310</a> which is a combination of stainless steel grills and plastic components offering improved performance and durability.Our popular entry level Weber Barbecue offer is the popular <a href="/product/weber-spirit-classic-e-210-46010074/">Weber Spirit Classic E-210</a>, and Classic E-310 series home BBQs. These Barbecues represent great quality, fantastic cooking, at affordable price points.<h5>The Weber Genesis Series Barbecues</h5>The Weber Genesis series takes barbecue cooking up a gear in terms of specification. You can feel the quality of the Weber Genesis and Genesis II gas barbecues as soon as you lift the lid. 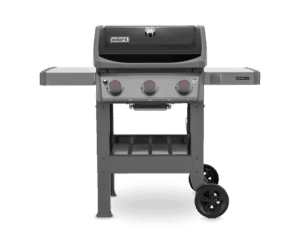 The New Weber Genesis II Barbecues start with the <a href="/product/weber-genesis-ii-lx-e-240-gbs-black-60014174/">Genesis II LX E-240 2-Burner BBQ</a> and also includes the larger, <a href="/product/weber-genesis-ii-lx-s-340-gbs-stainless-steel-61004174/">Weber Genesis II LX S340</a> Stainless Steel Barbecue.Weber Genesis E340 barbecue grill centre.<h5>The Weber Summit Barbecue Range</h5>The Weber Summit series is the ultimate in outdoor barbeque s, this is the cream of the Weber BBQ range which really has to be seen to be appreciated. 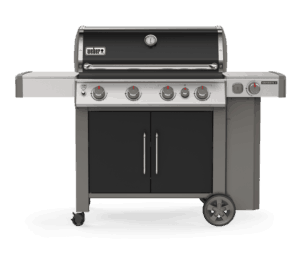 this range consists of the Weber Summit E470, Weber Summit S470, Weber Summit E670, Weber Summit S670, Weber summit grill centre with social area.<h4>Customer Service Guarantee</h4>Choose the best Weber gas barbecue for you. 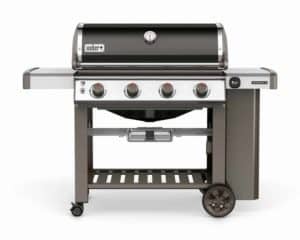 Whichever Weber gas barbecue grill you choose, you can be assured that you will receive the best value, the best price, the best attention, and the best advice. 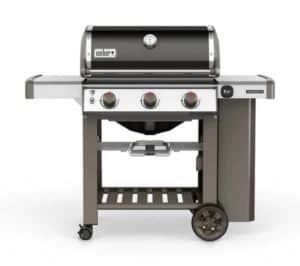 You can buy online here at Outdoor.ie or from the retail showroom in Goatstown, and you will be guaranteed that your purchase is the best barbeque solution for you.The Outdoor Scene's friendly and well trained staff are always more than happy to explore all your barbecue and outdoor cooking options. The Outdoor Scene takes great pride in our attention to detail and meticulous customer service. The Outdoor Scene also services the hospitality industry and other trade industries. Any commercial business enquiries are very welcome.